After the busy week I had with all the updates (may look into contributing authors), I decided to take a few days off to actually work on my stuff. However, I did want to get my first battle report up before the next game comes along. I’ll confess that this and my other battle reports may be a bit lacking. I don’t generally take notes or think about documenting a game while I’m playing it. I hope that will improve over time since it will help with the battle reports as well as general improvement to my gaming skills. This past weekend, my brother and I put together a play test of the new Chaos Space Marines codex. It was a complete departure from our normal games because this was the first time we had done anything with Chaos Marines. The points and game weren’t what you might call “formal” since we used 1850 points, just enough to get a variety of units, but we were both just wanted to see what Chaos Marines were all about. I do think there was a bit of an edge and story to the game as we pitted our armies against their most hated enemy. We went with no objectives or mission for this game, so it was straight victory points. Jerry won the roll to deploy first and go first, and I could not seize the initiative. Deployment on his side was very straight-forward. He lined his army along his side of the board placing his Thousand Sons, Chosen, and Chaos Lord in the center. To either side of them were his regular Chaos Space Marines with Raptors and Cultists beside them. In the ruins, he placed his squad of Havocs. All of this was bookended by his Obliterators. I set my army up in response to how he had deployed. I place my Rhinos with their Grey Hunter squads equally across the board. I put my Wolf Guard Battle Leader and his fellow Terminators in the center. I put my Land Speeders just to the right of them, and over on the far end I placed my Long Fangs. Cover was a bit lopsided in this game as I only had a few barricades, 1 piece of area terrain, and 1 building where as Jerry’s side 2 pieces of area terrain, 1 building, and plenty more barricades. I was unable to seize the initiative, so Jerry proceeded to move his army forward. 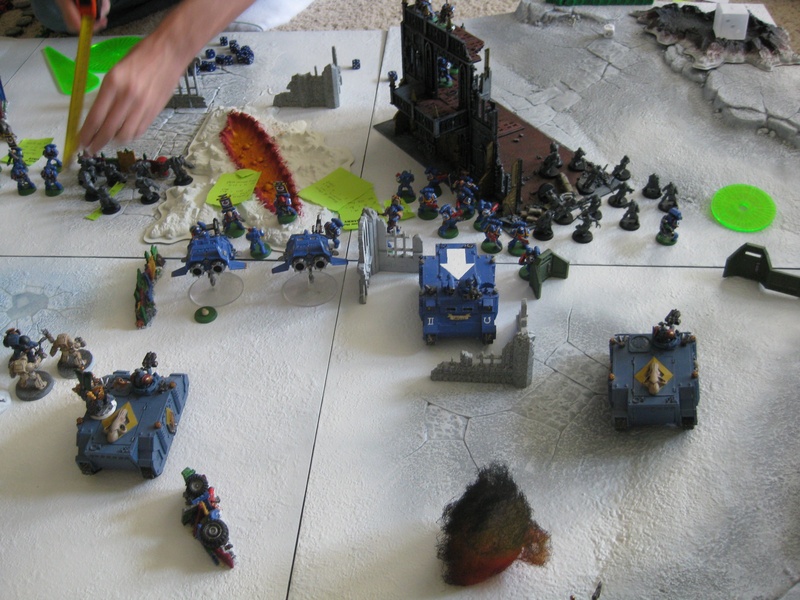 During his shooting phase, his Obliterator fired a plasma cannon that killed three of my Long Fangs. His Cultists took aim at the remaining Long Fangs but didn’t do anything. The Rhino that was on that side of the board was able to take out another Long Fang. That left me with only two, forcing me to take a leadership test, which I failed. The Long Fangs then fell back 7″. The Havocs that were hanging out in the building opened fire on my Land Speeder squadron and managed to take one out. The Chaos Marines ran 2″. His first squad of Thousands Sons tried to get a psychic power off, but my Rune Priest nullified the power. The remaining Thousands Sons fired on the Wolf Guard. I was able to save the three wounds that he had caused, but the second squad did the same thing. Again, my Rune Priest was able to nullify the Champions psychic power. I lost two Wolf Guard from the shooting, which set the remaining Wolf Guard on fire. His Chosen took some shots at my Land Speeders and caused 1 hull point to be removed. The Obliterator on the other side of the board fired a Lascannon at the skimmers but missed. After weathering a hail of bullets, my wolves were chomping at the bit to do some damage. After regrouping, my Long Fangs opened fire on the Cultists, killing 3 with ease. I moved the rest of my army forward, but kept my squads in their transports. My Rune Priest tried to fire Living Lighting at the Cultists but failed, so a Grey Hunter with the plasma killed another Cultist. The remaining Cultists had to take a leadership test that they managed to pass. My skimmers moved to fire their Multi-meltas on one of the Thousand Sons squad. Sadly, they managed to do nothing. My Rune Priest that was near the Wolf Guard fired Living Lighting along with a single plasma gun shot from one of the Grey Hunters riding with him at the Thousand Sons squad that the skimmers could do nothing to. They were able to kill one of the Thousand Sons. My Grey Hunters over on the left side of the board moved forword and fired both of their plasma guns at the second squad of Thousand Sons. One of the plasma shot had to take an armor save from the plasma gun getting hot and passed. Only 1 Thousand Sons marine died from the plasma shots. Since my Wolf Guard had no shooting, I ran them a whole whopping inch. Things were not going well. The Chaos Raptors moved into my deployment zone, giving Jerry a victory point. The Rhinos moved into a position to block line of sight for a few of my squads and to give cover saves to units that I could shoot at. The rest of his army continued their march forward. Jerry’s Obliterator on the right side of the board shot a multi-melta gun at one of my Rhinos. The ensuing explosion killed 3 of my Grey Hunters. The Cultists and Chaos Marines came out of the building and shot the Grey Hunters that survived the explosion, killing another Grey Hunter. The Havocs stayed in their perch on the top floor of the building, and fired their heavy bolters at the remains of my Long Fangs and killing them. All this gave Jerry another 2 victory points. The Thousand Sons in front of the Land Speeders shot at them, glancing only one of them. The other Thousand Sons squad shot at the Wolf Guard some more, but did nothing. Jerry then proceeded to assault what he could. His Chosen and Chaos Lord charged into the Wolf Guard, and his Aspiring Champion challenged my Wolf Guard Battle Leader. That left my two remaining Wolf Guard to deal with the rest of the Chosen and the Chaos Lord. The Thousand Sons that took pop shots at the Land Speeders assaulted them. My battle leader made quick work of the Aspiring Champion, but my other Wolf Guard did not fare as well. They were unable to get any attacks off. The Thousand Sons destroyed the Land Speeders, but the ensuing explosion killed one of the Thousand Sons. It was at this point that I was trying to hold on, but victory seemed unreachable. Over on the left side of the board, I unloaded a squad of Grey Hunters near the Chaos Raptors, and moved the Rhino to screen against any other unit shooting or assaulting later on. I also unloaded my Grey Hunter squad with Rune Priest near my battle leader to go in and help him, and again moved the Rhino into a screening position. The Grey Hunter squad that lost their Rhino inched forward in the terrain. I shot the Raptors with my bolt pistols and killed one. I took some pop shots at the Thousand Sons with my Rhinos but did nothing. The wolves over on the right side didn’t shoot because I didn’t want to lose any inches from the up-coming assault. They attempted to charge out of their terrain but failed. The Chaos squad’s over watch killed 2 men, leaving my squad with just the Rune Priest, my Wulfen and my Wolf Guard pack leader. My fresh Grey Hunter squad charged into the Chosen, and my battle leader challenged the Chaos Lord. Like before, my Wolf Guard Battle Leader made quick work of the lord, and my Grey Hunters managed to kill 3 Chosen. Over to the far left, my Grey Hunters charged into the Raptors. My pack leader challenged the Aspiring Champion and defeated him with ease. The rest of the squad killed 5 Raptors with no casualties to my squads. Now I had to weather another round of merciless shooting. The Obliterator over near the Raptor fired a twin linked melta gun at my Rhino and immobilized it. A Thousand Sons champion was able to get off a Flame Storm at my Rune Priest and his meager squad. They were able to survive. The Obliterator that was beside the Cultists lumbered up and fired a heavy flamer, and still the squad held on. It wasn’t until the Cultists open fired that the squad of three was reduced to two with the Wolf Guard pack leader dying. The Raptor’s supporting Obliterator assaulted the Rhino that he had previously immobilized and destroyed it. The Obliterator that shot my Rune Priest assaulted my Rune Priest, but was unable to land a hit; my Wulfen was able to land a wound on the Obliterator. A squad of Chaos Marines were able to move into position near my Grey Hunters that were still in combat with the remaining Raptors. 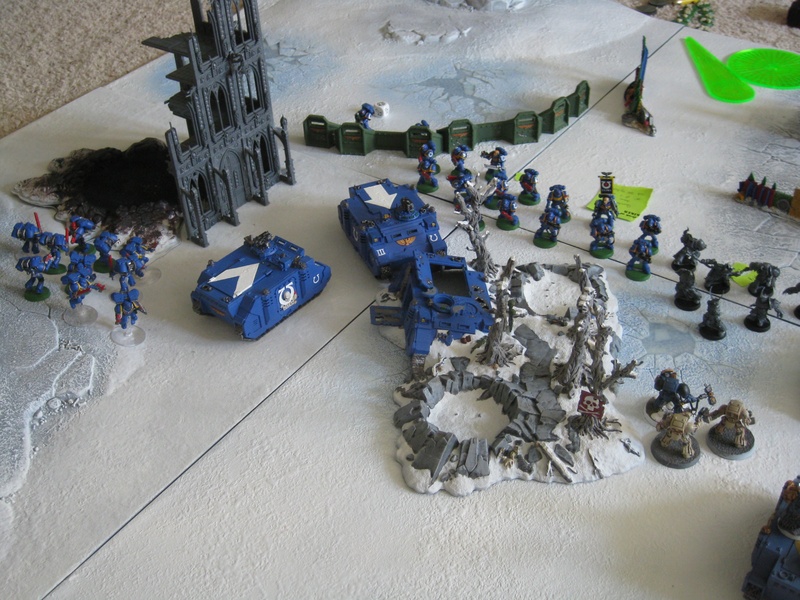 A squad of Thousand Sons in front of my Wolf Guard Battle Leader and Rune Priest opened fire, killing 2 of my men. The second squad of Chaos Marines and Cultists assaulted my Rune Priest and Wulfen, where they were killed. The Thousand Sons assaulted my Grey Hunters with the battle leader. The Aspiring Champion challenged my battle leader. Much like before, my battle leader made quick work of the champion with no wounds done to him. The remaining squad killed 2 Thousand Sons with 2 casualties of their own. My Grey Hunters that were in combat with the Raptors were assaulted by a squad of Chaos Marines. The Aspiring Champion challenged my pack leader. This time my pack leader fell with the champion. 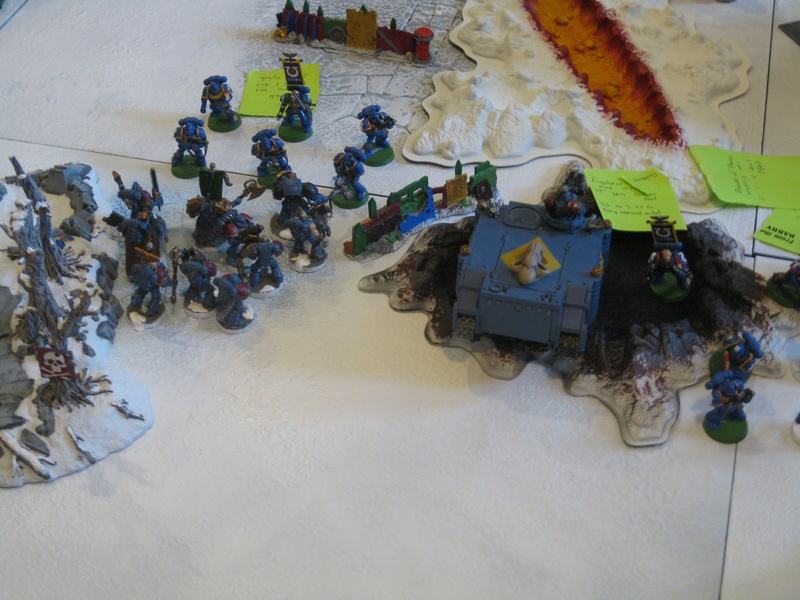 The remain squad suffered heavy damage by losing half their squad, and were then over taken in the sweeping advance. It was at this point that I raised my hands in defeat because I had nothing left on the board but one squad. I will admit that this game made me mad at several points. For one, I really couldn’t roll to save my life, literally. The real reason why this game frustrated me so much was that it was a complete departure to what my brother and I usually play. If he plays his Ultramarines, I know he’ll sit back and shoot me, but once I close in on him I can begin to bring the hurt. With Jerry’s Tyranids, I know that I will get eaten, but I will do as much damage and hold onto as much ground as I can before then. This game, though, was very different. The ease with which he was taking out units was unreal. The only saving graces for my army were the Rune Priest denying every psychic power the Thousand Sons tried to make, and that my army could push back and deal some damage once it got into close combat. My experience as of now is that a Thousand Sons themed army is hard. They are expensive, but worth it. On my end, I could have probably managed my points better. Maybe not taken such a small Wolf Guard squad or not take them at all. As for heavy support, I’m still up in the air about Long Fangs. I feel that I would get better results from something else, like a Predator or Vindicator. I’m intrigued and scared to see what would have happened if we’d upped the points or lowered them. I’m also excited to see what I can do with a Death Guard themed army, which I’ll get my chance for this weekend. In short, the play test showed that the Chaos Space Marine codex can put up a very good fight, and has excited me enough to begin building an army: piece by piece and slowly. My wife’s morbid curiosity drove her to see how my last squad would fare against the remainders of Jerry’s army. My Battle Leader was killed in a challenge with Jerry’s Sorcerer. 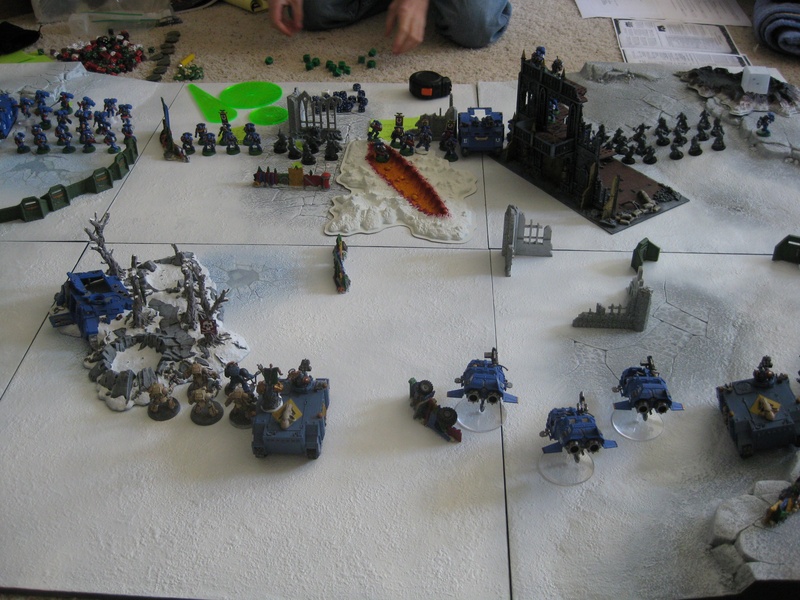 The remaining 4 troops I had were gunned down by Jerry’s Havocs, Obliterators, and the remnants of two other squads. Finally, only my last Rune Priest remained. Alone, on fire, he charged a full squad of Cultists. Furiously, he attacked with his close combat weapons, killing 3 Cultists with no wounds suffered. As the remainder of the squad tried to flee in terror, my Rune Priest followed close behind, cutting them down to the last man. Shortly thereafter, my Rune Priest was fired upon by all of Jerry’s army that still held a gun. He did not survive.